CIMT College is a leading provider of IT Training in Microsoft and CISCO. CIMT College was proud to have recently conducted a 5-day 40-hour customized training for a group of eight employees from HUB Parking Technology, a leading specialist in parking solutions. The group was a mix with varying levels of experience and technical skills; however, the instructor was able to personalize the training in order to accommodate all learner levels. The training requirements were unique as it covered specific content and Labs from both Windows Server and CCNA. 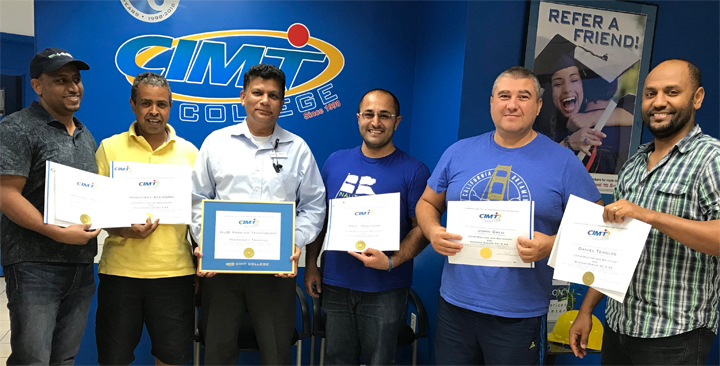 The training was primarily conducted at the client location in Mississauga with Labs conducted at CIMT College, Malton Campus. We are happy to strive to accommodate specific location requirements as needed! Our experienced instructor, Mac, who has over 25 years of experience in IT and has certifications in Microsoft and CISCO, successfully conducted this customized training. All the participants received certificates from CIMT College, and we were thrilled to present a framed corporate certificate to HUB in recognition of their choosing us. CIMT College offers many certification and diploma programs in IT. We have the infrastructure and network of trained instructors to meet any corporate training requirements for IT Training. CIMT College is a member of the Microsoft Imagine program, and we are CISCO Networking and CompTIA Authorized Academies. As an authorized Pearson Vue and Prometric Testing Centre, CIMT College provides convenience for students and professionals to write their certification exams.